Don’t worry we won’t judge you if you can’t pronounce quinoa. We’ve heard a lot of different ways how to say this indescribable grain and honestly, it doesn’t really matter how you say it. Just walk on over to the bulk foods section of your grocery store, grab a scoop and start emptying quinoa into a small bag. We recommend getting between a quarter pound to a half a pound of quinoa, (there should be a scale in this section). If you’re grocery store doesn’t have a bulk section, then maybe a local co-op will have quinoa in bulk. We encourage you to try this new food out if you haven’t already because it’s definitely good for you and seriously easy to make. 1. Empty water into a small or medium sized pot and put the stove on high. Let the water boil and while you wait for this to happen start rinsing and then cutting up the fruit into small pieces. 2. Once the water has boiled, lower the heat to medium low and empty the quinoa into the pot. Place a cover on top or just let it sit for about 10 minutes. Stir occasionally to make sure the bottom doesn’t become burned. 3. 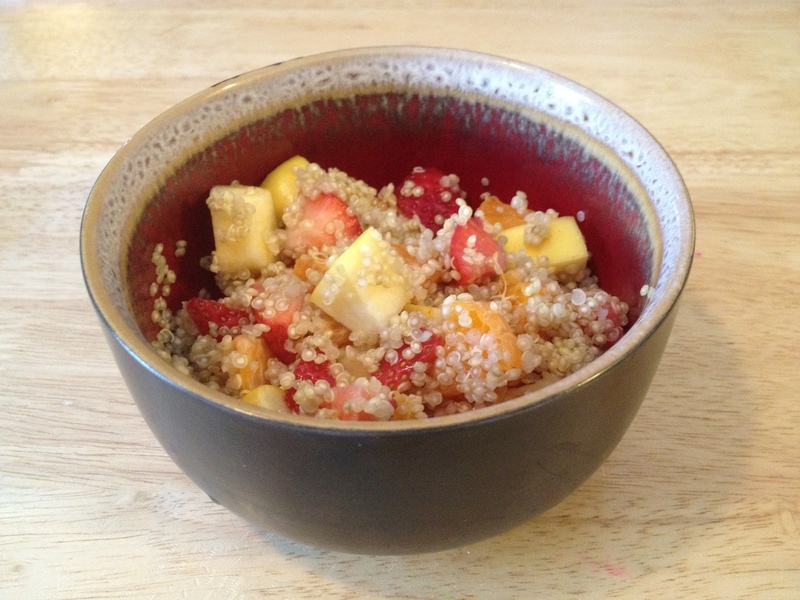 After it’s cooked all the way, empty the quinoa into a bowl and add your fruit into the bowl as well. You can use your hands or a fork to move the fruit around and then place in the refrigerator. I really prefer this salad cold but you can try it warm as well. You may need to leave it in the fridge for about 15-20 minutes. When I made this salad the first time, I made it about 3 hours before our meal and left it in the fridge for awhile. Before dinner I took the salad out of the fridge and presented it for one of our family dinners one night and it was really an unexpected hit. Try out this recipe and let us know what you think! Also, let us know if you substituted any of the fruit listed above for something else! You can also soak the quinoa overnight to soften it, and this will eliminate rinsing it. Love that you guys are using quinoa! It’s a true super food and so easy to add to anything. Did you know you can make bread from it, too? Here’s a recipe that we use here in Peru to make delicious honey quinoa bread. Try it one day and let me know how you like it! Let Them Eat Funfetti Cake!